With the beginning of each Islamic year, our scholars and Imams remind us of the story of the momentous Hijrah (migration) of our beloved Prophet Muhammad (peace be upon him) and his companion Abu Bakr (may Allah be pleased with him) from Makkah to Medina which they undertook over 1400 Years ago. This Migration was a very special journey and a turning point for Islam and Muslims in that it was chosen to mark the beginning of the Islamic calendar. Perhaps the first lesson that is striking, and is often not talked about, is the difficulty and magnitude of the decision to migrate itself. We tend to think that this migration was a simple 3-day journey by camel between 2 cities, and don’t give much thought to its implications in those days. Living amidst the globalised tourist industry, we tend to forget the difficulty of taking a journey to a completely new territory which you’re not accustomed to the terrain, culture, or people. By all scales, the migration itself as an act was not that easy. How many of us are truly ready to leave our homes, our families, our businesses and just go to a new town and start from scratch? So, the question is why? Why did the Prophet (peace and blessings be upon him) migrate? The standard answer is that the migration occurred to escape persecution from Makkah and save the Prophet’s life (peace be upon him) from an evil assassination plot. But I believe there’s another reason, one that derives an important lesson about the Hijrah: staying in Makkah with the persecution from the Makkan people was unproductive for the Prophet (peace be upon him) because the environment was not conducive for the message which he (peace be upon him) carried, Islam. The Prophet (peace be upon him) had to find a way out, he (peace be upon him) had to find a venue for his message to flourish. In essence, the migration was not about saving his life, but it was about saving the message and fulfilling his mission! The evidence of this is that immediately after reaching Madinah, the Prophet (peace and blessings be upon him) didn’t relax but immediately went through an all-embracing process to establish a faithful and strong society by building a mosque, establishing a market, managing the politics of the new town, and so on. 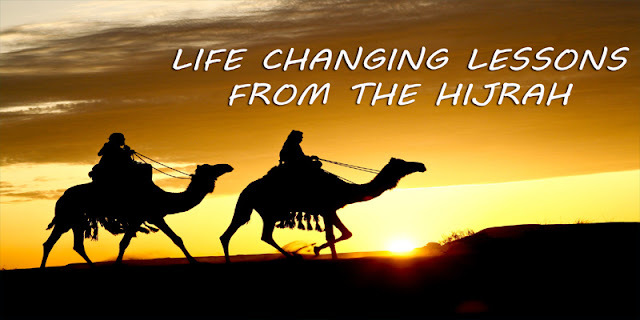 So there’s a deep lesson here about the Hijrah that is subtle but important – it is that the Hijrah is a process of transfer to a better situation to enable you to be productive and active vicegerent on Earth. It is not meant to be a means to find a comfortable place where one would relax and stop being productive. Rather, it is a search for an environment more favorable to continuous and constructive productivity for Allah’s sake. Think how you can apply the above to your life? What do you need to ‘migrate’ from in order to live a productive lifestyle in conformity with your purpose of worshipping Allah (Subhanhu wa Ta’ala)? It doesn’t have to be migration from place to place, but it could be migration from a non-halal job to a halal one, or migration from sins to repentance, or from evil deeds to good deeds. Prophet Muhammad (Peace be upon him) and his companion Abu Bakr Al-Siddeeq (May Allah be pleased with him) went through a lot of preparation for this epic journey. They prepared their transportation, planned how to hide their tracks, hired a guide, and even appointed the people who’d bring them the news from Makkah and who would bring them the food each night. One might ask: Why did the Prophet and His companion have to go plan so meticulously to go on this Hijrah? Wasn’t this Journey blessed by Allah (Subhanahu Wa Ta’ala)’s permission for the Prophet to migrate to Medina? Aren’t these the best of people in those times? Surely, Allah (Subhanahu Wa Ta’ala) could have prepared for them a miracle of instant transportation to Medina like He did in the journey of Israa wal Mi’raaj? When we think of these questions, we realise, that this journey was not about the Prophet and his companion only, this journey was for us – the Muslims – to learn deep lessons from, to study from it and extract unforgettable lessons that apply to all times. The Prophet and his companion prepared and took all the means to teach us the lesson that even being the best of mankind, even if you worship Allah, you need to use the means Allah has provided to achieve your goals in life. This indicates the need for action to fully trusting in Allah’s decree, in fact it’s part and parcel of believing in Allah’s decree. The above point is highlighted further in those precious moments where Abu Bakr Al-Siddeeq (May Allah be pleased with him) spent with the Prophet in that cave between Makkah and Medina. They were hiding there, but the Makkans were able to trace their tracks to the cave. When the Makkans approached the cave, Abu Bakr Al-Siddeeq started panicking saying: “O Prophet, if they look to their feet they’ll see us!” But the Prophet’s confident response was: “Don’t be Afraid, Allah is with us”. These powerful words should be on the tongue of every Muslim and Muslimah in any situation of difficulty he/she faces after you’ve exhausted all possible means. This requires a special mindset that comes with training and constantly self-evaluating your actions. When you have goals, you need to force yourself to prepare the utmost whilst at the same time praying and pleading to Allah as if you’ve no means at all. You honestly taste the sweetness of true tawakkul when you strike this balance between taking the means and trusting in Allah (Subhanahu Wa Ta’ala). One final beautiful lesson from the Hijrah is the instruction that the Prophet (Peace be upon him) gave to his cousin, Ali ibn Abi Talib (May Allah be pleased with him) asking him to return the ‘Trusts’ that were with the Prophet to the rightful people in Makkah. Imagine you’re in a town where most people don’t like you, they make lies about you and they want to kill you. But they also trust you with all their precious goods. On the night you are about to leave, you could potentially take ‘revenge’ for all the pain and suffering they caused you, instead you actually return these goods to them! What does that teach us? What does that tell us about our attitude to the Non-Muslims even when they harm us? It teaches us that our measuring stick in Islam is Justice, not our whims and desires or revenge or hatred. We do justice even to our worst enemies and this is how we become servants of Allah instead of servants of our desires. We become truly the Best of All Nations when we apply such principles in our lives. These were some of the productivity lessons from the beautiful Hijrah, we hope we can learn from them and apply them to our lives so we can have a true turning point within ourselves just like the Prophet and His Companions did after the Hijrah.